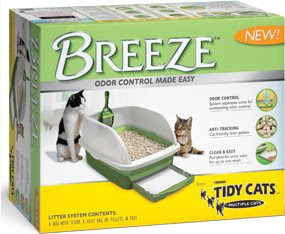 The BREEZE Litter System is a new solution to one of my very least favorite chores: cleaning the litterbox. The biggest perk of pregnancy, as far as I was concerned, was not being allowed to scoop the poop. (And the eventual baby, of course.) We have six cats, so it's kind of an ordeal. Actually, we had eleven cats while I was carrying Jasper so I really got out of some heavy duty crap,so to speak. Anyway, the BREEZE Litter System uses proprietary pellets that are dust free and won't track the way ordinary litter does. 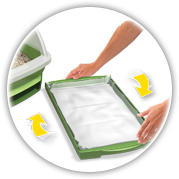 The BREEZE Litter System also utilizes special cat pads that only need to be changed about once a week. Sign me up! The way the BREEZE works is simple: cats use the box as usual but instead of absorbing waste the way traditional litter does, solid waste stays on top of the pellets for daily removal while liquid waste passes through to the cat pads in the lower drawer. The BREEZE Litter System does take some getting used to. I'm not a giant fan of looking at the turds sitting there, although I suppose that would be a good incentive to dispose of them as soon as you noticed them. Also, while you're scooping, there is a definite odor involved so that might be a drawback for those with a low gag reflex. And the pads are pretty big and unwieldy when sodden. (Think wet diaper.) Still, you only have to deal with it once a week… not too bad. 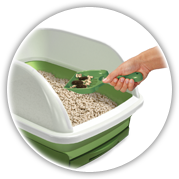 If you're in the market for a new litterbox and you don't have a roaming explorer baby on the loose, the BREEZE Litter System could be a good solution for you.